Eve Muson is an Assistant Professor of Theatre and Head of the B.F.A. Acting program at University of Maryland, Baltimore County. Her professional directing credits include Inexcusable Fantasies (Strand Theater, Prague Festival Fringe, FringeNYC), Speech & Debate and Las Meninas (RepStage), Venus, Big River, and Peter Pan (Olney Theatre Center,) and many productions at Boston Playwrights Theatre, American Stage Festival, and Edinburgh Festival Fringe. 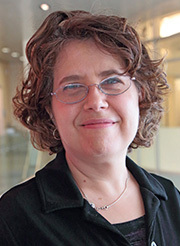 She is the principal director for GRRL Parts, UMBC’s festival of new plays by women: for this annual project, Eve has directed premieres by Sheila Callaghan, Tanya Saracho, Lucy Thurber, Ellen McLaughlin & Timberlake Wertenbaker. She serves as a director in new play development at WordBRIDGE Playwrights Laboratory. She has directed dozens of university productions including Las Meninas, The Cripple of Inishmaan, Arcadia, Slavs!, Metamorphoses, Two Shakespearean Actors, and many new plays and devised works. She has been twice cited for Outstanding Direction by the Kennedy Center/American College Theatre Festival for her work on Un Tango En La Noche (Boston University) and Las Meninas (UMBC.) She teaches courses in acting, dramatic literature, and devised theatre. Her particular research interests include collaborative playmaking, and the development and production of new works.